Clinical introduction A young adult with Friedreich ataxia complaining of exertional breathlessness underwent a cardiological evaluation. On physical examination, high blood pressure and a loud systolic murmur were noted. ECG showed sinus rhythm with voltage criteria for left ventricular hypertrophy (LVH) and T-wave changes in the inferolateral leads. Transthoracic echocardiography showed biventricular hypertrophy (maximum wall thickness of the interventricular septum 26 mm and 16 mm of the posterior wall), preserved systolic function, mild left ventricular intracavity gradient and an unremarkable mitral and aortic valve. A cardiovascular magnetic resonance (CMR) was requested for further assessment. 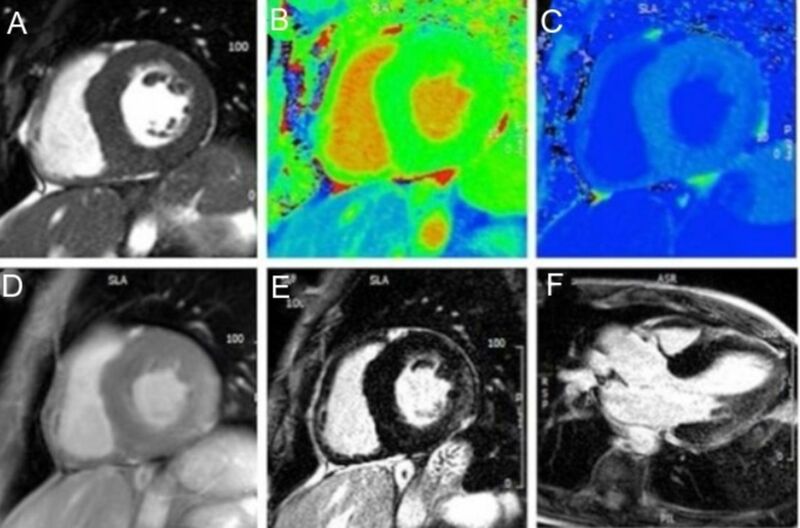 CMR protocol, performed using a 1.5 T scanner, included cine images (figure 1A), native and postcontrast T1 mapping (shMOLLI, figure 1B,C), and early and late gadolinium enhancement (LGE) images (figure 1D–F). Native T1 values were mildly reduced (≅911 ms) in the septum and low-normal range (942–974 ms) in the lateral walls. Normal values 962±25 ms at 1.5 T. Postcontrast T1 values were diffusely reduced. (A) Basal short-axis cine. (B) Native T1 mapping basal short axis. (C) Postcontrast T1 mapping basal short axis. (D) Early gadolinium enhancement basal short axis. (E) Basal short-axis late gadolinium enhancement (LGE). (F) Three-chamber LGE. Question Which is the most likely diagnosis based on these findings? Contributors CB-D and EGM are responsible for the concept of the manuscript and wrote the manuscript. IBH and CB-D reviewed the manuscript. IBH obtained informed written consent.